As part of the Cameron Ross network, who have 200 stores which can be called on to measure for each of the network stockists, we offer either traditional or contemporary highland wear hire with a tartan to suit every taste. Whether you want a traditional outfit in black watch tartan with a bow tie or one of our more modern black or grey tartans, we can guarantee there’ll be something to suit every shape & style. When you order from Stewart Highland we offer you our in-store dressing service, to ensure you look good and feel great on the day. 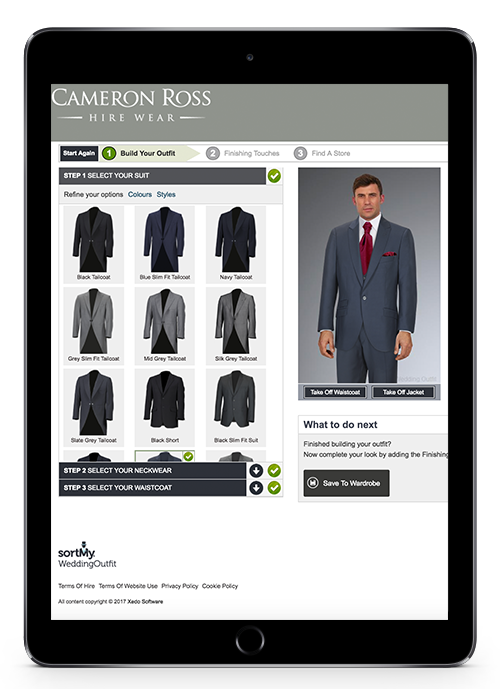 For those of you who are unsure which outfit to select, the ‘Outfit Builder’ allows you to compare different styles & tartans in the comfort of your own home before you visit us for your consultation and measure.